At EHG, we are experts in London Home Staging and Interior Styling, however don't just focus our styling services skills on making homes ready for the market to potential buyers, we also work across the rental market, and help with light refurbishments, freshen ups, home styling, furniture/accessory rental and purchase bundles within London’s ever-growing Holiday rentals market. Air Peace of Mind http://www.airpeaceofmind.com/ was set up in April 2016 to help homeowners who are keen to rent out their London properties, but require a Host to manage them. Air Peace of Mind market their property portfolio across AirBnB, along with other carefully selected high-end platforms, as well as listing properties on their own Air Peace of Mind website. 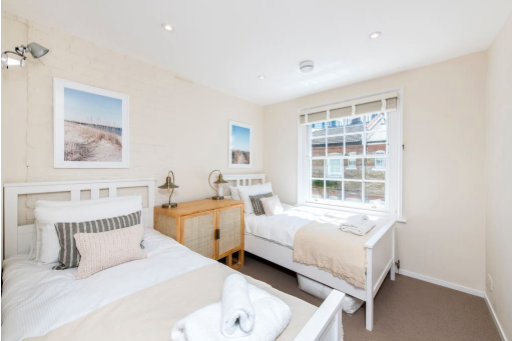 We were asked by Air Peace of Mind to refurb a mews house in Battersea for their client which needed some creative love, furniture and styling before they could list it “hotel ready” as opposed to getting “market ready” for guests coming to London on holiday. An increasing number of landlords are turning away from long-term rentals in favour of using Airbnb and other similar platforms to let out their properties for holiday lets. The trend is being driven by higher income tax many landlords face under a new regime being phased in over the next few years. Buy-to-let has become less profitable since the Government introduced tougher tax rules. In a recent survey, conducted by Portico, 90% of landlords said they would use Airbnb to short-let their property. This growing trend has seen landlords increasingly use both Airbnb for short-lets and estate agents for long-term tenants collectively, to avoid rental voids. It also offers a solution to an empty property and lapse in revenue between long-term tenants and gives landlords more freedom to buy or sell their property when the time is right for them and the market instead of waiting out tenancies. So, Landlords and Homeowners if you are thinking this all sounds rather good, then please read on….after all, doesn’t helping to pay for your holiday whilst you are away sound incredibly appealing? Homes with personality stand out from the crowd when listing, and we LOVE to make our clients homes stand out like a beautifully polished thumb, by giving them our signature laid back luxury feel. Our dedicated in-house Home Concierge team of Interior Stylists and handymen will take away the stress of getting your property market ready to host guests, and Air Peace Of Mind will look after all guest relations. Our super-skilled team of interior stylists will have your home looking swish, swanky and impeccable, we can work with your existing furniture, or if perhaps you feel it’s looking a little loved but tired, we can provide beautiful furniture bundles curated with your property in mind to bring out your homes best features, and our handymen will attend to any unsightlies that need fixing - we’ve got it all covered so you can relax just reap the rewards! Ponder that once you have used our Home Staging and Interior Styling service, with your property looking it’s best and whilst waiting for a sale we will use the professional photos and get your property listed through Air Peace of Mind to maximise on your income short-term and help cover the cost of the furniture rental. We just advise guests that a service similar to a room service when you stay in a hotel may be required should any buyer viewings (within reason) be required during their stay, and of course be at their convenience. Sounds simple, right? For the most part, it really is! There are some criterias you will need to consider depending on your personal tax circumstances, your mortgage terms, insurance if you are a leaseholder but one HUGE plus and added bonus is the cost of furnishing the property can also be written off for tax purposes against rental profits. Savvy stuff! Above is the current live link to the property, so you can see how good your property could look once we have had our creative hands all over it! 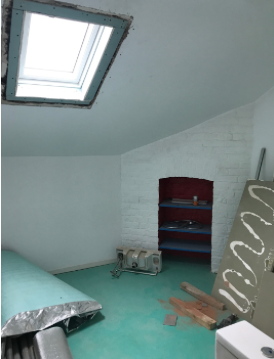 This client had quite a tight budget, but when we began to delve further the electrics and plumbing it all needed updating to comply with current regulations and landlord requirements, however, we were sensitive to budget and did our best to make the most of what we had to work with. 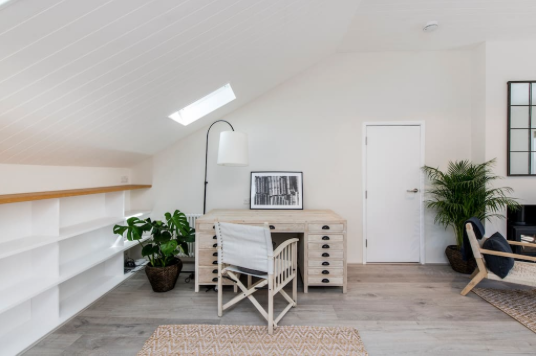 As this was quite a voluminous space, we suggested to the client that we put a tongue and groove on the ceiling which has helped the space and contain the echo. We dropped the Kitchen shelf by 30cm or so as quite a block to the eye when you entered the room. 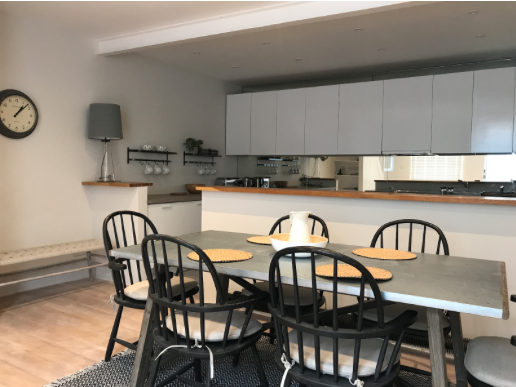 We sanded back the wooden floor in dining area, put a light grey oak flooring in the Kitchen zone, changed the stainless steel kitchen worktop to an oak laminate, put a mirror splashback in which really helps lighten this area and repositioned the spotlights. We put a mirror in the alcove, recarpeted and painted in warm neutrals. 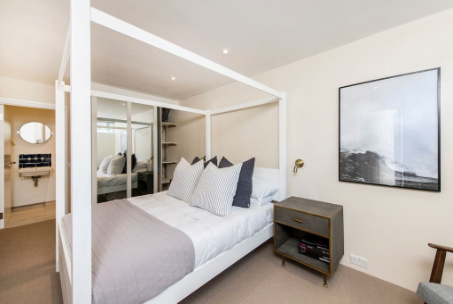 The master bedroom was a converted garage and felt a bit like it so we adapted the wardrobe with mirrored sliding doors, carpeted and decided on a four poster bed to create the feeling of a little lux. New blinds and shutters were added throughout the property, these new england style shutters were very cheap and are very effective and they can have different coloured tape down the sides to suit your colour scheme! We went for twin bed options in the 3rd bedroom good for family living arrangements and styled with a fresh beach house scheme. The bathrooms just needed updating, so we worked to update the chrome fittings and the tiles keeping costs down, but with great results. 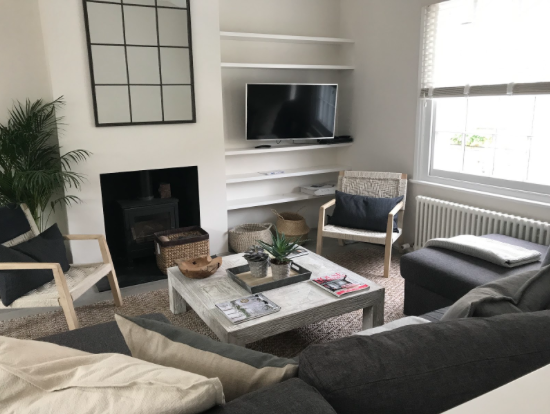 We can work with any property, furnished or unfurnished, in this case the client was able to purchase one of our fantastic EHG curated bundles, as furniture was needed throughout the 3 bedroom mews house. We absolutely LOVED this project, and are delighted to say that since the day we finished our work the property has had two bookings! 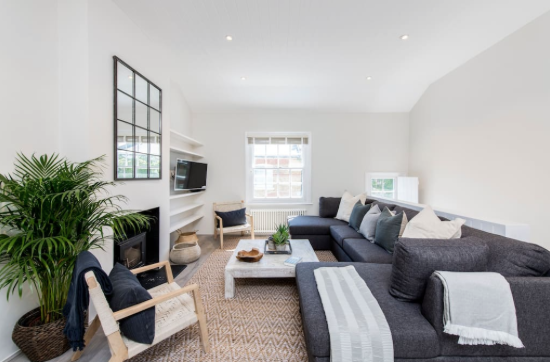 We wanted to bring our signature “laid back luxury” affordable approach with a relaxed Scandi vibe to the style, whilst taking into consideration the type of property, and focused on creating a welcoming and comfortable space with a hotel like experience. Et voila! We did it. If you are a Landlord (or Homeowner) with a property to rent our short-term, we can help and would be able to work our magic on your property and refer you to Air Peace of Mind. The homeowners wanted to let out their home whilst they were on holiday so asked us to help get the property guest ready. We brought in some cushions/throws and accessories, and made sure everything worked together. We also used some of the homeowners bits and bobs for the styling too so it was ready for photos for the listing and ultimately ready for guests to stay.